Whether completing a literature review, gaining access to communities of interest, or analyzing data back at the university, research is a journey filled with twists and turns. For example, you may have an amazing thesis initially; however, upon reaching the field you realize that reality is not the same as it is presented in literature. You may also realize the issue you thought was affecting your target group is different than you assumed. A change of plans can be frustrating, especially after arduous preparation prior to entering the field. This does not mean that your project is over with; in fact, this can be fun. It is important to remain flexible, and open to change, as it is all a part of the journey. I had an idea of what I would find, yet upon reaching the field I immediately had to change my project within the first week of my two-month Cuban journey. My work examined Abakua, an all-male secret society in Northwestern Cuba. Established in 1836 by slaves, Abakua secretly operated as a mutual aid network which provided protection for slaves, and later as members gained key positions within blue collar professions, a network guaranteeing Abakua initiates employment over those who were not. With temples located in communities of Havana and Matanzas deemed marginal, Abakua is celebrated as an authentic legacy of the Afro-Cuban experience, especially as it is forbidden from being exported or initiating non-Cubans. President Obama’s plan of reinstating relations between America and Cuba seemed to represent the metaphorical doors opening. I questioned whether Abakua would regain control over the docks and slaughterhouses of Havana, and if they would initiate more foreigners as this would arguably increase economic reach. I planned to do archival work in the Biblioteca Nacional and ethnographies of Abakua ceremonies. Shortly after my arrival to Havana, President Donald Trump announced plans to restrict American travel to the island. I also realized how difficult it is for a religion to have power within a socialist society. Tourist dollars that were coming into Cuba were not reaching the masses of people on the outskirts of Havana and Matanzas. I was fortunate to have interviews with Abakua members and Cuban scholars my first week in the field. I was notified that power granted through control is not what Abakua represents. Instead, the legacy of Abakua is rebellion against power structures. Members emphasized that manliness, or hombria, is central to Abakua and driving forces behind the bravery that earned them their reputation. In order to be initiated, one must be considered to be a good man by all members of his community and go through an investigation process that will prove this. From initial interviews, I gathered that many youths in marginal sections of Havana had been initiating into Abakua and committing crimes, which many believe is in accordance with demonstrating connections to Abakua. This phenomenon, known as guaperia, and the question of what it truly means to be a man and Abakua member came up so frequently that I decided to further examine this situation. Instead of focusing on how Abakua members would respond to a changing Cuba, I decided to interview members on their life-stories, asking what brought them to Abakua. I also wanted to gather a general consensus of member’s opinions on the differences between hombria and guaperia. After narrowing my focus, I then faced another problem: access. I needed consistent access to Abakua members in order to gain entry into ceremonies and hold more interviews with members. I needed to make sure that I was not offensive. As Abakua is a secret society, many people were apprehensive to discussing the topic with me. I ensured interviewees at all times that I was not after ritual secrets, but only wished to understand cosas sociales. I also was open to learning about the other Afro-Cuban religions and their roles and perception within Cuban society. Things changed when I was introduced to a writer and journalist who happened to be an Abakua member. After meeting with him a few times, more doors began opening, and I found myself having interviews with more members and being invited to important events. Stories of exclusivity and power ignited much of my interest in Abakua. However, during my time in Cuba I realized that manhood and fraternity sustain Abakua’s reputation and there is a thin line between hombria and guaperia. 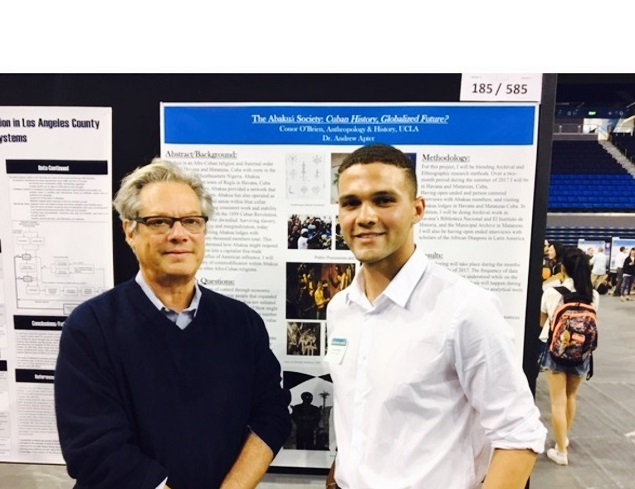 Undergraduate research has been a great opportunity that has developed me both academically and intellectually. Being flexible and open to changes that occur throughout this process is one of the strongest strengths a researcher can have. The times where I felt frustrated, fearing that I would never gain access, were the instances where I began to understand Cuba and what it is like to be an American researching a complex topic.